This CellML model runs in both OpenCell and COR to replicate the published results (figure 6a). The units have been checked and they are consistent. ABSTRACT: We have developed a minimum kinetic model for cross-bridge interactions with the thin filament in smooth muscle. 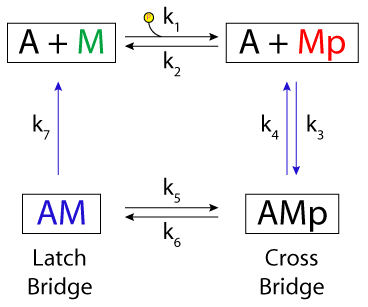 The model hypothesizes two types of cross-bridge interactions: 1) cycling phosphorylated cross bridges and 2) noncycling dephosphorylated cross bridges ("latch bridges"). The major assumptions are that 1) Ca2+-dependent myosin phosphorylation is the only postulated regulatory mechanism, 2) each myosin head acts independently, and 3) latch bridges are formed by dephosphorylation of an attached cross bridge. Rate constants were resolved by fitting data on the time courses of myosin phosphorylation and stress development. Comparison of the rate constants indicates that latch-bridge detachment is the rate-limiting step. Model simulations predicted a hyperbolic dependence of steady-state stress on myosin phosphorylation, which corresponded with the experimental observation of high values of stress with low levels of phosphorylation in intact tissues. Model simulations also predicted the experimental observation that an initial phosphorylation transient only accelerates stress development, with no effect on the final steady-state levels of stress. Because the only Ca2+-dependent regulatory mechanism in this model was activation of myosin light chain kinase, these results are consistent with the hypothesis that myosin phosphorylation is both necessary and sufficient for the development of the latch state. Derived from workspace Hai and Murphy 1988 at changeset df0a4755df6f.